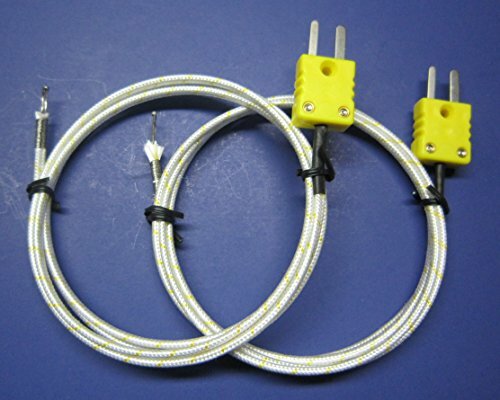 This is a set of 2 reliable high temperature thermocouples with a K-Type sensor. The sensor is at the tip of a 3 ft long wire probe, which has a high temperature ceramic fiber insulation. It has a miniature type connector that will work with digital K-type thermometers. This probe can used to measure air or gas temperatures, it can be attached to pipes or embedded into objects you want to measure. Excellent to use in kiln, pottery, metal working or high temperature ovens or furnaces. This is our new 2017 version with improved ceramic fiber insulation and a chromel metal wire at the tip, which prevents the unraveling of the ceramic fiber insulation at very high tempreatures in the kiln.